I love brownies. I’ve always always loved me some brownies. We have a restaurant in the town nearby that sells these amazing brownies and I would always buy like 5 of them to bring them home and kiss devour them because they are so good. But I love making homemade brownies at the same time. Now see, I grew up with my mom making boxed brownies, no shame. She always had a way of making them feel and look homemade and I always thought that they were until shocker I grew up and realized they were a box mix! so I have absolutely nothing against ever using boxed mixes. Semi Homemade is amazing no joke. But lately I’ve been into this kick of making my homemade ones. Usually I use my go to recipe, but I figured I’d switch to up a little bit with these Butter Brickle Brownies and I’m so happy I did. 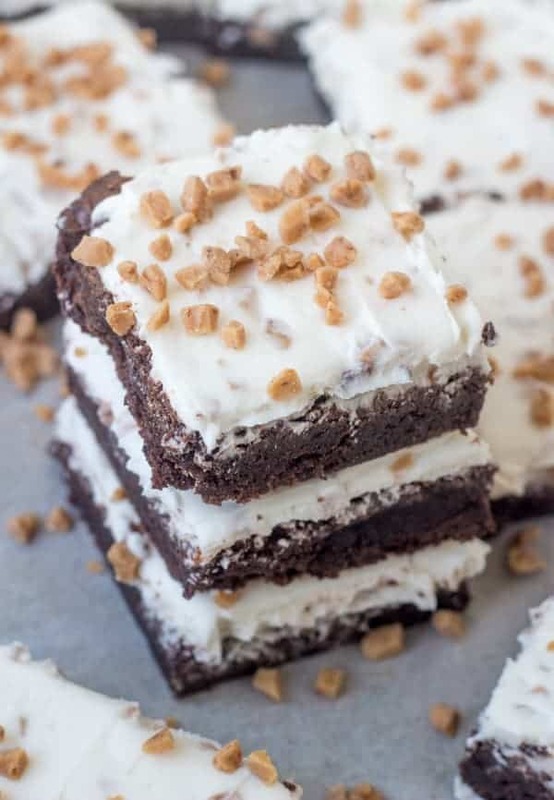 These are moist and soft and chewy and with a homemade butter brickle frosting spread out over the top just really sets that flavor off amazingly. So to be completely honest with you, I’ve never been the hugest fan of toffee. Like I don’t make it and I don’t buy it to munch on. The texture just has never been something I enjoyed so much. But they make brickle in chocolate chip size now. Perfect size, perfect texture and it has changed my toffee game completely. The frosting itself consists of butter, shortening, powdered sugar, butter extract and these brickle pieces. A little bit of crunchy right along with the creamy makes it the perfect profile contrast with nothing to “heavy” per se. they make a good holiday dessert, potluck treat or just midnight snack for all my fellow chocolate lovers out there. So if you wanna easily switch up your brownie routine then these puppies are for you. In bowl add your chopped chocolate and butter and melt in microwave for about 30 seconds at a time until smooth and creamy. Set aside to cool slightly. Place your oven wrack in the bottom 1/3 of oven and preheat to 350. Line a 9x13" baking pan with parchment paper, set aside. Add your cooled chocolate to a large bowl and whisk in both your sugars. Add in your eggs and whisk until combined fully. Fold in your salt, flour and cocoa powder. Pour mixture into your prepared baking pan and bake for about 30 minutes or until center seems set. Remove from oven to let cool completely. Meanwhile to make your frosting beat together your butter and shortening. Add in your extracts and beat until combined. Adding one cup at a time mix in your powdered sugar until you reach your desired consistence. Fold in your brickle bits. Spread over cooled brownies and sprinkle with more brickle if desired.